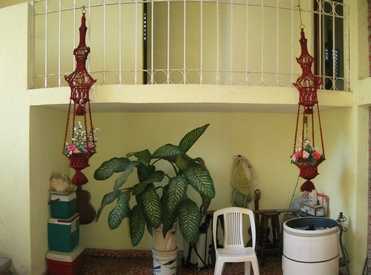 This home is Located behind the church in central La Manzanilla. 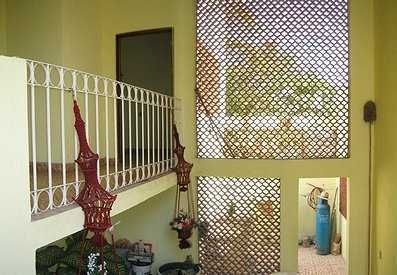 There are a total of four levels with 4 bedrooms and 3 bath's constructed on 300 square meters of property. The home begins at street level with a 3 car garage then continues up the hillside with the view of downtown and the ocean increasing at each level. This is the second level open-air living area, which connects directly to the kitchen giving both lots of fresh air and a wonderful view. 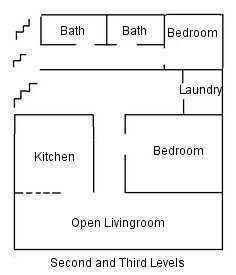 A hallway connects the bedroom and the middle area seen below. and then on to the fourth level. The ventilation area leads to the laundry area. 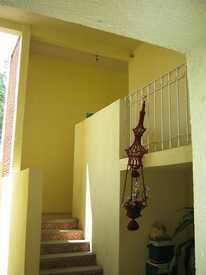 This type of ventilation is used all through the home. The contents of this site are copyright c 2004, Daniel Hallas. All Rights Reserved.